Have you ever dreamed of entering a water park and enjoying the day away? I know I have. Whenever I think of waterparks, I imagine the fabulous water slides and rides. I mean, who doesn’t? I love the adrenaline pumping rides and the screaming people. Now when I heard about Siam Park in the Canary Islands, I went crazy and booked a ticket. Yes, I went solo. I started my adventure with a free bus going to the water park. By the time I got there, I was speechless at all the sights. The place was complete with gigantic water slides, water rides, a massive swimming pool big enough to be called a beach, and so many beautiful tourist attractions worth taking a photo off. All these got me all excited and started to queue on my first water ride in the water kingdom of Siam Park. I started with Siam Park’s Tower of Power which has an almost vertical 28m drop going at 50mph. A quick fact, the Tower of Power is one of the 12 tallest water slides on the whole planet. When I was climbing to the top, I was beyond excited, but when it was nearly my turn to slide down, I was asking myself, “What have I gotten myself into?” I didn’t think the water slide was that high. Sliding down, the only thing on my mind was “OMG OMG OMG Yeah!” It was a scary yet fun experience. By the time I was nearing the exit, I was amazed at all the majestic sharks that I saw on the saltwater tank. After the adrenaline pumping experience in the tower of power, I decided to go for a ride at the Lazy River. Apparently, it is the longest lazy river in the world, and indeed it was a long relaxing ride. Even the surroundings were landscaped beautifully; there were plants, an aquarium and some Thai architecture scattered around. There was also a waterfall. What I loved the most during my ride was the Jacuzzi at the finale. To say that it was an excellent experience is an understatement. A beach within a water park that in itself piqued my interest. I went to check it out. The colossal beach has white sand and a spectacular view of the Atlantic Ocean and the La Gomera Island. The place is complete with some palm trees, sun beds and parasols, a beautiful terrace and two beach bars. This is where it gets better. The water park boasts of a beach, water slides, and a wave pool. 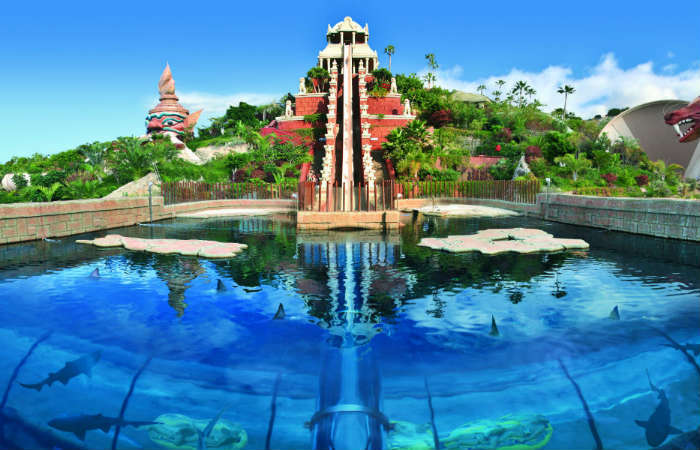 Siam Park has the biggest artificial waves in the whole world! Up to a 3-meter height, the waves offer a great surfing spot, especially for beginners. If not for surfing, others go and swim with the waves while some enjoy the water lapping at their feet on the sandy shores of the beach. I enjoyed the wave pool and stayed here for almost two hours just enjoying the waves and swimming. That’s it. I also rode some of the rides like the Jungle Snakes, the Dragon, Naga Racer and so on but all those will be another story for another day. What I can tell you though is that throughout the day, the water park gets more and more crowded. It was one hell of an experience with all the long queues I had to go through.